The mash up of two cult classics turns out to be not only fun, but highly addictive as well! 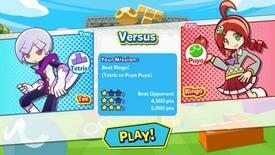 Puyo Puyo Tetris combines two of the most popular puzzle games in a whole new dimension. Released in early May for both the Nintendo Switch and PS4, this game mashes together the cult classic Tetris and introduces Western gamers to the popular Puyo Puyo franchise. For me, this is a winning combo and has the potential for a cult following from the get go. Puyo Puyo for those who are not familiar, is a tile matching game hailed from the early 90s but since the late 90s, has been taken over by Sega with later releases coming out from the same makers as the Sonic franchise. Puyo Puyo Tetis cleverly squeezes in the core elements of both games into a puzzle game that has both gameplay styles complementing each other. Some people may be unfamiliar with the Puyo Puyo style of play but it’s actually really easy to get a hang of. All you have to do is match together four of the same colour of puyos that fall down in pairs. However, the real strategy of the game is that rather than trying to match them as fast as you can, you should try to score the most points by carefully laying out the puyos, so that when one of them pops, you get to take down the rest of them in a colourful avalanche that’s a pleasure to watch. Tetris on the other hand hasn’t changed since its previous iterations, with the main goal still being to laying down an unbroken row of tetromino pieces. I feel that no matter how many times you play this game, it’s still fun and engaging. Dare I say, addictive?! The game serves up a wide variety of play styles and with 100 stages in story mode there are no shortages of levels either. Or, use the Arcade play mode from which you can choose what mode of play you would like. The first Arcade mode is ‘versus’ where you and 3 A.I players or 3 friends battle against each other. But there’s a twist, which is that if you get a combo in Puyo Puyo and clear multiple lines in Tetris at the same time, you send junk blocks over to your opponent that gives them a disadvantage. 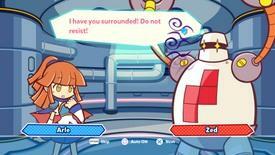 The game ends once a players blocks or Puyo reaches the top of the screen. The second Arcade type is ‘Swap’ where each player has a Tetris and a Puyo Puyo board and the game swaps between these two boards every 25 seconds. I found this incredibly fun because you are basically keeping up with the change in gameplay continuously and even if you crash and burn, it’s still really entertaining. In ‘Party’ mode, players compete for the highest score and have items on their boards, which they can use to buff themselves or debuff their opponent. 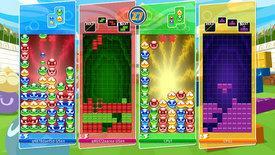 ‘Big Bang’ mode puts Puyo Puyo players into Fever mode and Tetris players into Lucky Attack. This mode is a frantic race between players to get the most combos before the time reaches zero. When it does, the points you have been scoring throughout the round are used to deplete the other players health bar. The first one to have no health loses, but if all players are still alive after that round then a new round begins, this continues until there is only one player left. In the last game type being ‘Fusion’ combines both gameplay styles and mashes them together, meaning that Puyos and tetriminos are played on the same board. In this mode pieces change between Puyos and Tetris pieces as they drop, and tetrominos move any Puyos below them to above that piece. This type of gameplay is probably the most difficult of the bunch but is incredibly rewarding when you finally master it. To wrap up, Puyo Puyo Tetris is an incredibly fun, engaging and fast paced puzzle game, which I’d love to see it become a classic in years to come.